Universal access to all knowledge will be one of humanity’s greatest achievements. We are already well on the way! from Stewart Brand's: Brewster Kahle's 30 November Long Now Talk For fun and inspiration, check out the Internet Archive for the more than 3 million books (adding 1,000 titles per day), 100,000 concerts and 1 million recordings (3 new bands uploading / day), 600,000 movies, and of course the web itself. Thanks, Internet Archive and Brewster Kahle - and wow! and the Open Access Directory just sailed past our 2 millionth view of the OAD. here. As we begin to address these challenges, it is also timely to begin other overdue discussions, such as Dissension in the Open Access Ranks on CC Licenses. Following are a few graphs illustrating the dramatic growth of open access over the past few years. 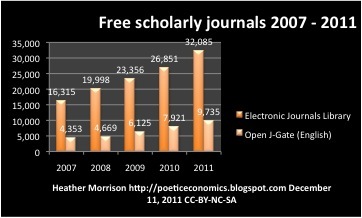 Peer-reviewed OA journals increased from under 2,000 in DOAJ in 2005 to over 7,000 today, with over 6,000 english-language journals listed in Open J-Gate. 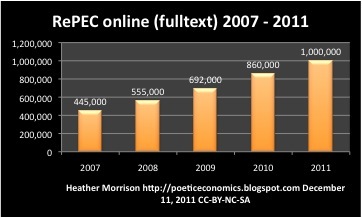 Not all scholarly journals are peer-reviewed - not even subscription journals! From 2007 to 2011, the number of free journals of academic interest doubled from 16 - 32,000 as listed by the Electronic Journals Library, or 4, 000 to close to 10,000 English language journals as listed in Open J-Gate. 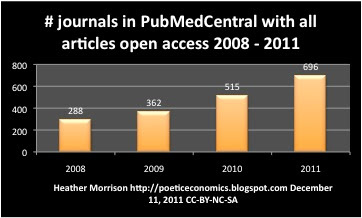 The number of journals contributing all articles as open access to PubMedCentral more than doubled from 288 to 696 from 2008 to 2011. The number of open access archives has more than tripled from 2006 to 2011, from about 850 to well over 2,000. 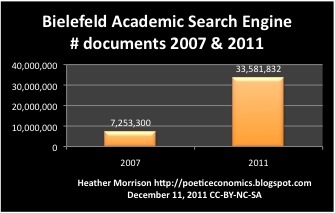 The number of documents BASE searches has grown from 7 to 33 million from 2007 to 2011. Even the mature RePEC more than doubled in size in the past few years, from 400 thousand online documents in 2007 to over a million today.